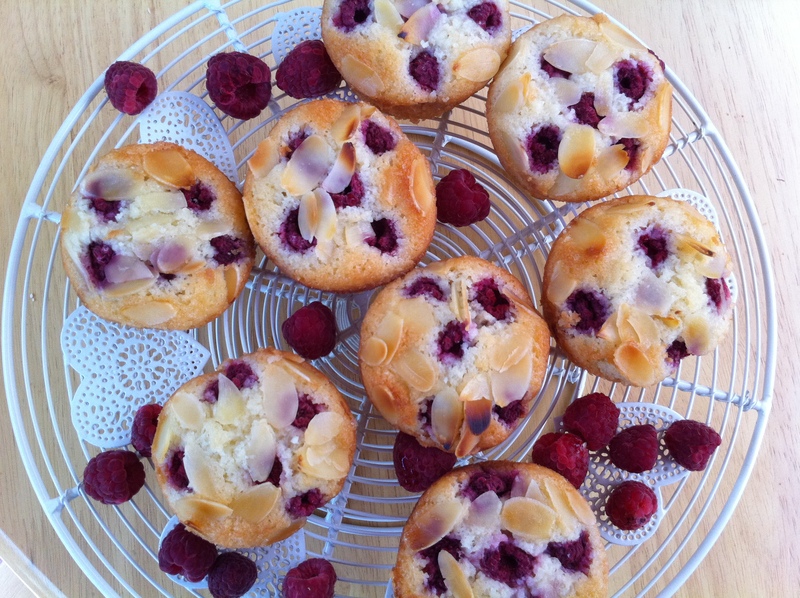 RASPBERRY & ALMOND FRIANDS | YUM YUM PIGGY'S BUM...! This week, I have a baking treat for you to try out. In the past, I haven’t done a whole lot of baking because I’m not super confident about making cakes but decided to give it a go after buying a fabulous book “Gifts from the Kitchen” by Annie Rigg. The pictures in that book are very enticing and tempted me to test out one of her recipes “raspberry, lemon and almond friands” even though I hadn’t eaten a friand before. Friands are little almond cakes originally from France but now the Australians have taken them to heart. They love them and have adapted them to include all sorts of fruits. 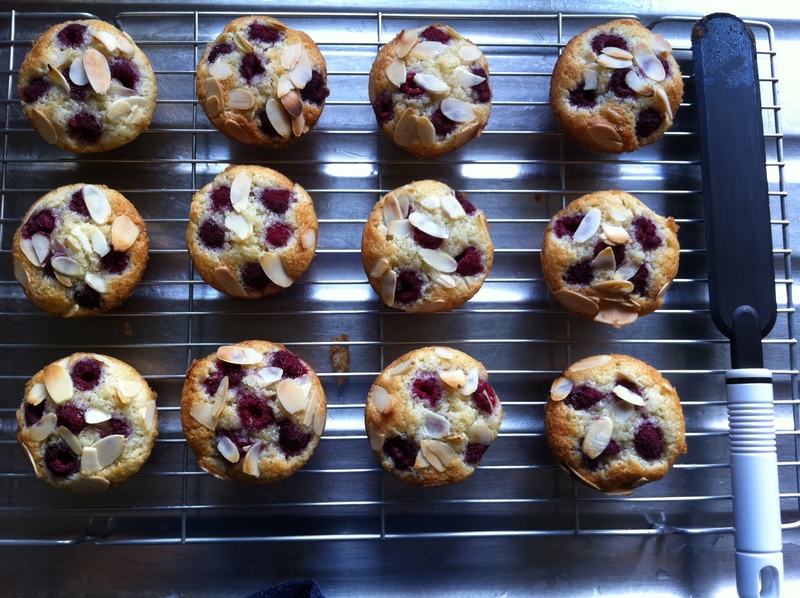 As usual, I adapted this recipe and made raspberry and almond friands in a muffin tin tray instead as I didn’t have any friand tins (they’re like oval-shaped muffin tins). You can use muffin paper cases for convenience but you’ll miss out on browning and crisping the friands. The air in the whisked egg whites help to make the little cakes fluffy and light and they have just the right amount of cakey richness. Really enjoyed making these friands except for the egg white whisking bit as it made my arm ache, took me about 10 minutes! Baking them makes your kitchen smell lovely and homely. Eating them was even better, very light and moist in texture, Annie Rigg’s recipe was well worth testing! If you like raspberries, almonds and cakes, then have a go at making these beautiful little sweet creations. Great to eat accompanied by a pot of freshly brewed English tea. Butter a 12-hole non-stick muffin tin and dust with with plain flour. Then turn the tin upside down and gently tap the bottom to get rid of excess flour. I did this outside in my back garden to minimise getting flour everywhere in my kitchen! Do not miss out this stage as this helps to crisp and brown the friands and helps ease them out of the tin. Preheat oven to 180 deg C/350 deg F/gas mark 4. Sift the flour, icing sugar and ground almonds into a large bowl and make a well in the centre. Whisk the egg whites in a clean, grease-free bowl until they look foamy and show soft peaks when you lift the whisk through the egg whites, the peaks should drop down slightly. Carefully pour the melted butter into the bowl containing the flour, icing sugar and almonds. Then add the egg whites to this mixture, use a metal spoon to carefully fold the mixture together until mixed. Do not mix vigorously otherwise you’ll eliminate the air bubbles from the egg whites and the friands won’t be light in texture. Spoon the mixture into the buttered and floured muffin tin, filling each hole three-quarters full. 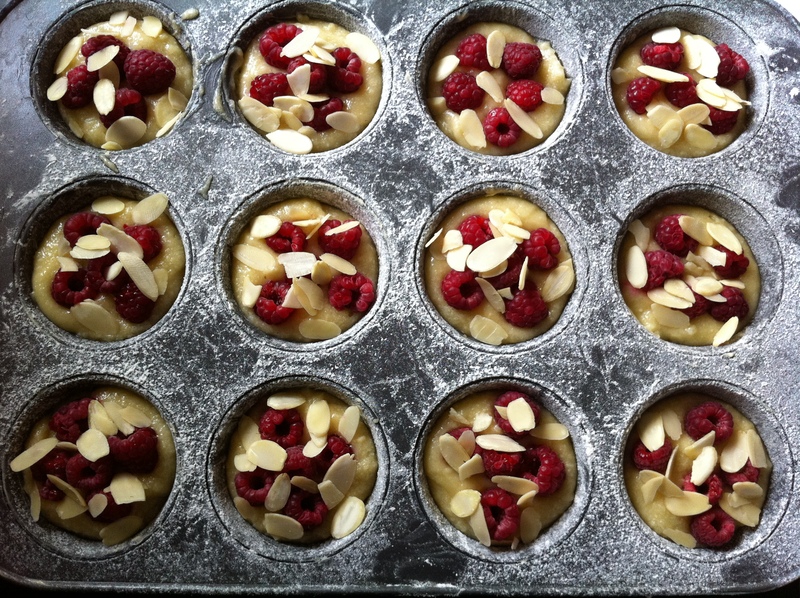 Add 4 or 5 raspberries to each muffin hole and scatter the flaked almonds over each muffin. Bake on the middle shelf for 15 minutes or until well-risen and golden brown on top. Leave muffins to cool for about 5 minutes before using a palette knife to carefully lift the muffins out of the tin. Leave them on a cooling rack until cooled. Dust with icing sugar if you prefer. Store them in an airtight container for 4-5 days. ← I WANT TO BE EIN BERLINER!